After reviewing Justice League and Justice League Unlimited for four and a half seasons, I’ve come to realize that humor is what makes these two series so fresh and enjoyable. No matter how dire the situations get, there’s always room for a little levity, which the writers expertly use to diffuse tension and amplify the dramatic elements of the story. The use of comedy makes everything more fun, especially when combined with the lively, exaggerated DCAU house style. At a time when superhero comics embraced darker narratives and visuals, these cartoons stood out by keeping everything kid-friendly, but the writers were still very careful to keep the product appealing to adult fans of DC’s heroes, incorporating more mature themes and the occasional innuendo into the scripts. 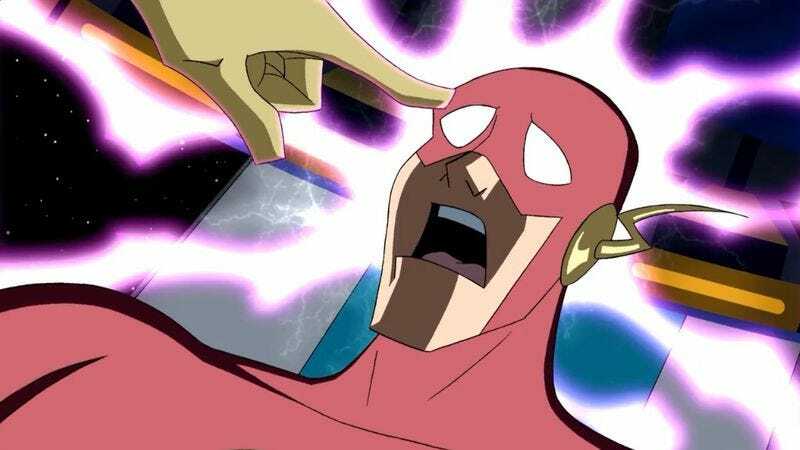 One of the comic highlights of these five seasons is “The Great Brain Robbery,” an episode that intensifies the conflict between the Justice League and the Legion of Doom by switching the minds of The Flash and Lex Luthor. After weeks of speculation, the League finally gets a good look at their opponents when Flash finds himself behind enemy lines in Luthor’s body, and Lex gets to show how much of a threat he is by using Flash’s speed to single-handedly take out his superhero opponents. But the thing that makes this episode so remarkable is the humor, taking advantage of the Freaky Friday scenario to deliver some of the series’ funniest moments. “The Great Brain Robbery” is a showcase for Clancy Brown and Michael Rosenbaum’s vocal ability, giving them the opportunity to dig deep into two different characters that are polar opposites in terms of personality. Clancy Brown’s work as Lex Luthor has always been one of the strongest performances in the DCAU, but he gets to explore a completely different part of his vocal range when he plays Flash as Lex, elevating his pitch and delivering his lines with a more playful energy. Brown has the more challenging material of the two actors, but he has no problem capturing the awkward discomfort of Flash attempting to act like Luthor. Brown really commits to Wally’s attitude, making the character’s behavior even more hilarious because the audience can still hear Lex’s voice underneath. The Flash as Lex storyline is where writers Dwayne McDuffie and Matt Wayne lean into the comedy angle of this scenario, playing with how Wally’s personality contrasts with what the audience knows about Lex Luthor. As we see in this episode’s opening scene (and have seen many times in the past), Luthor is an intense, very serious supervillain that doesn’t abide foolishness, but Wally is all about foolishness. It’s what makes him so lovable. He jokes around and makes himself look dumb in front of all the ladies and generally keeps things light and bubbly, which makes it very difficult for him to assume Lex’s persona without arousing suspicion. Rosenbaum’s role is simpler for a couple of reasons: To start, Lex isn’t trying to fool the League into believing that he’s The Flash; he’s just trying to find his way back to Earth from the Watchtower, and he’ll do whatever it takes to accomplish his mission as quickly as possible. Also, Michael Rosenbaum played Lex Luthor on Smallville for years, so he just has to switch into the voice he used on that series, making his performance in this episode a special treat for fans of the Superman prequel. The material for Lex as Flash isn’t especially funny, which makes Rosenbaum’s key moment of humor all the more impactful. Lamenting his current situation in a bathroom, Lex leans in front of the mirror and says, “If nothing else I can at least learn the Flash’s secret identity.” He pulls off the mask and there is a long pause as he stares at the redheaded reflection before finally admitting, “I have no idea who this is.” Why would he? Wally West is just a regular guy from Central City. It’s a brilliant moment that finds humor by taking a realistic look at the superhero/supervillain dynamic, playing on the drama of the unmasking to deliver a fantastic punchline when the secret identity means absolutely nothing to the bad guy. The Lex as Flash narrative gives the writers the opportunity to show how powerful the hero could be if he really let loose, and Lex’s intelligent use of superspeed makes him especially dangerous. Director Dan Riba does strong work with the action, particularly the train robbery sequence involving the Legion of Doom hijacking a locomotive transporting a shipment of euros. There are so many great villains available this season (even without the Batman rogues), and they each offer different opportunities for action choreography. I especially enjoy the employment of Sinestro in this episode, who is able to make explosive constructs with his yellow ring that look really cool. In the midst of all the superhero high jinks, the stakes still manage to rise for the ongoing conflict between the League and the Legion. The League has a much better idea of what they’re dealing with now that they have Flash’s first-person account of the Legion of Doom’s headquarters, and they also know that the power structure within the group of villains is on rocky ground. 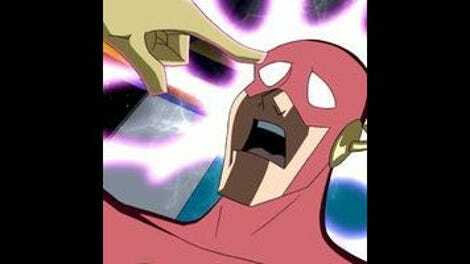 Ultimately, these plot points are secondary to Wally and Lex’s development, and devoting time to these characters and their talented voice actors makes “The Great Brain Robbery” a particularly remarkable episode of JLU. This episode’s title is a play on The Great Train Robbery, so it’s fitting that the Legion of Doom’s plan actually involves a train robbery. Those writers sure are clever. The CW announced a new digital animated series starring Vixen at its Television Critics Association presentation this past Sunday, tying into the established CW superhero universe of Arrow and The Flash. Not much else is known about the project yet, but because it’s animation, I would love to see Gina Torres return to voice Mari, although I could see The CW going for a younger actress. Judging from the promotional images, the design and art style are very much in line with the look of Young Justice, which is a great thing. Here’s a look at Vixen in action! While the main characters in this episode are white men, I appreciate the diversity of the supporting cast this week. Three of the main Leaguers in action are black men (Green Lantern, Mr. Terrific, Steel), and Dr. Light, an Asian female, sees more screen time this week than she ever has in the past.